My oldest daughter may be too old for the typical themed birthday party with cake and ice cream, but she’s never too old for me to make her day special. It seems like just yesterday when I planned fun and elaborate birthday parties for Rayana, like her 13th birthday when I sent out invitations with just a tater tot glued to the front (sprayed with clear paint) for her Napoleon Dynamite swim party. A dozen girls swam, snacked on “gosh-darn quesadillas” and tater tots, and delighted at the ice-cream sundae bar. Then when the sun began to set, they sat on towels in the grass to watch an outdoor showing of the movie while being served buckets filled with popcorn, licorice and glow-in-the-dark bracelets. Sigh, I miss those days. Even though Rayana and her friends now “go out” for her birthday, I always hold a special gathering where everyone can stop by and share in a “casual” celebration with food, cake and punch before heading out for whatever college kids do nowadays. This year I decided on a “Breakfast at Tiffanys” inspired party. The Tiffany’s necklace is actually Rayana’s. She received it as a gift from my husband the day the twins were born. The inscription reads, “You Will Always Be the #1 Girl”, and it still brings a tear to my eye. It’s been seven years ago since she got that necklace, and a while since she’s worn it. So, for decoration, I retrieved it from her jewelry drawer and had it shined to put on display, and to remind her that she will always be number one. There’s no need to go buying expensive party decor. I used a mannequin from my closet and wrapped it with ribbon, then put a crown on top. I used beautiful frames that I already had to insert custom-made signs that I printed myself. And of course- it wouldn’t be a party without my favorite chandelier cupcake stand…. I love that thing (thank you, HomeGoods!) Come to think of it, the mannequin, frames and cake stand are all from HomeGoods as well. Our snack- a Mashed Potato Martini Bar where guests got a martini glass with a scoop of mashed potatoes, then selected their toppings of cheese, bacon, green onions, chicken and/or olives. I have no doubt Holly Golightly would approve. Chocolate-covered strawberries add elegance to any occasion, but gave my party table a beautiful contrast in color. And here it is, my shining-star photo of the day- The Breakfast at Tiffanys Cupcake. Beautiful. The diamond ring?- $2.99 at the party store. Happy Birthday to my “number one girl”… I’m already thinking ahead to next year! Each year we celebrate my grandmother’s birthday with a fun themed party. When you’re 84 I think every year is cause for celebration. I’m the one always tasked with coming up with party themes, and this past year I could think of none better than a 50’s diner inspired-party with Diner Milkshakes made with First Street Ice Cream. After planning was complete, it was time to shop. At Smart & Final, I expectedly found everything I needed for my party and more. I came across some gumballs and thought they would fit in perfectly with our theme. We made both strawberry and chocolate milkshakes for our party and they were a huge hit with our guests. And, if you’re lucky enough to have someone you can bribe into putting on some roller skates and a retro apron to serve milkshakes, it’s a fun touch. I’m fortunate to have my oldest daughter Rayana, who I can always count on to help me with family events. For more recipe ideas with First Street Ice Cream from Smart & Final visit them on Twitter and Facebook! I am a member of the Collective Bias™ Social Fabric® Community. This shop has been compensated as part of a social shopper insights study for Collective Bias™. All opinions expressed herein are very much my own. So what did Madonna, Cyndi Lauper, The Breakfast Club and I have in common this past weekend? We all celebrated my niece’s 14th birthday at my house- 80’s style. With my husband and kids away for the weekend in Utah, I had promised my gorgeous niece, Mira that she could have a sleepover at my house for her birthday present. What I learned from this experience of having very little time to plan and make party preparations (thanks to a more-than-usual hectic week) is that a little imagination can go a long way. With the party seriously just hours away, I had to think- and think quick- about how to make her 80’s Party come to life. Mira’s only request was that there be neon-colored cupcakes- a request I thought would be no problem thanks to all the recent blitz about cupcakes… thank you Cupcake Wars. Unfortunately, none of my local cupcake boutiques were offering up neon, and it was too late for a special-order request. With a can-do attitude and a handful of ideas, I headed off to Michael’s Friday night and purchased two black poster boards for $.59 each, a box of Duff neon food coloring, some bright feathers, candy and gift trinkets. And, after swinging by my grocery store for some cake mix and powdered sugar, I was set. Next, I printed out different images from the 80’s- album covers, movie posters, etc. It wasn’t difficult for me to find these images since I’m a child of the 80’s, my brain was able to remember names easily. I cut out the images, glued them to the poster board and splashed neon paint on it. Every party needs a party table. Starting with a base, I built from there. just about done- the party is just minutes away! Along with some pizzas, tater-tots and chicken wings (they are, after all, 14-year old girls), I made some neon-colored spaghetti to serve with either alfredo or marinera sauces. The girls loved it. We are ready! Let the 80’s party begin! I assumed the girls had a great time, or as I gathered from the laughing- no shrieking- coming from downstairs all night. It sounded like Justin Beiber just walked into my house about every 20 minutes… until about five in the morning. They played Just Dance, called boys on the phone, made random trips outside to the trampoline.. and ate every last cupcake. Oh, to be 14 again. As I locked myself in my room away from the noise with a glass of wine and my laptop, I watched this video that made me want to shriek myself- thank you, Chromeo and today’s youth for embracing just how fabulous and fun the 80’s were. I’m trying not to feel old, but my niece is throwing an 80’s-themed party the way I would have thrown a 50’s-themed sock hop in my younger days. Ouch. I feel another glass of wine coming on. Easter is approaching. So what better giveaway than something to use for the upcoming holiday? These adorable handmade Easter cones from Flair Designery are this week’s Manic Monday from The Organized Cook. It’s easy to enter- simply visit and “like” Flair Designery Facebook Page, then visit and “like” The Organized Cook Facebook page leaving a comment about Flair Designery so we know you entered. The winner will be announced this Friday. 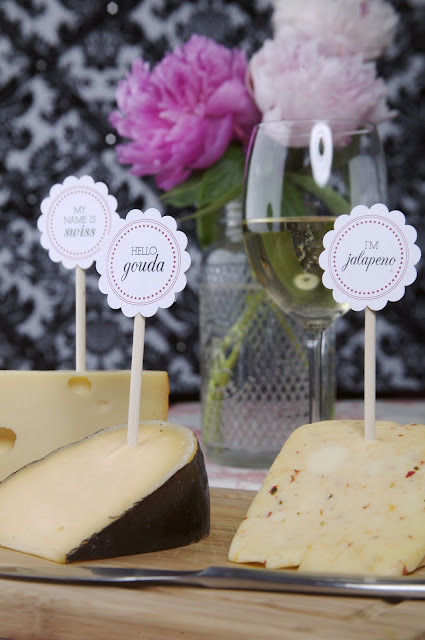 I first found and fell in love with Flair Designery when they posted these printables for a Fabulous Food party. So, what’s on your dinner menu this week? Let The Organized Cook do the planning and organization for you.